Sunday: long run. A total write-off. 27km @4'25" pace, but they felt like 52km... I had back pain, extreme sense of fatigue, legs like stones, lack of sleep ... really awful set of sensations. After 20k I felt like after a marathon... and the worse of it is that my HR was rock bottom, only 140bpm average (only 70%HRmax), with many miles at 135. That is really unusual and sign of poor recovery and fatigue. I will take 2 days very easy and sleep more..
Saturday was not really a hard workout, but it was pleasant to run with Stefano and make some strides on the track. I tested for the first time my spikes Mizuno LD and they felt great. We run series of 100m and 200m and got always beaten... I can predict that Stefano, given his talent, committment and smart training, is really on a rising curve and will be the man to beat in Hong Kong for the season. My personal tribute to Samuel Wanjiru and his great race. It was a fantastic marathon to watch. He is a very humble guy and it is amazing how well he can speak Japanese (he actually married a Japanese woman..). Sunday: 10k race in 34'57" + w/u and c/d total 20k (detailed report already posted). Looking at the race as competitive event, I should be rather happy. As fitness test, not really satisfactory, felt like crap after 7k and miss completely my target time. a "real" Kenian in a race in HK is incredible... actually he was a Kenian living and running in Malaysia who was on some short holiday in Hong Kong. Together with him, the race line-up also included 2 invited runners from Taiwan. With 28C/90% Rh at the start, I did hope to make a good race and set a time around 34'30"/34'40". In the past 2 weeks I felt the pace of 3'25"/km quite affordable. But in reality, I did not make the counts with the lingering fatigue from the heavy workload training for the marathon. I started well, making a good pace that lined up very quickly all the local competitors (the overseas runner were soon gone, disappeared ahead with a different speed). It was particularly pleasant that the only one who kept pace was my occasional running partner E. (see many older posts). Sharing those heavy workouts was really beneficial for me and did really brought him a great improvement. ...but simply I felt out of gas, not really ready to make any increase of speed. At 5k mark, we were even able to catch one of thew taiwanese invited runner, but he easily resisted at my attack and shook me off again. So I just cruised to the line in 34'57", just ahead of a slight margin to E.
Bad: hei, I really expected to go faster. No actual improvement in time versus last month's race on the same course. Maybe was a bit hotter and sun was shining, but at 7k I switched off the engines, not really a good sign. I need to understand if the fatigue is due to normal training adaptation or I am overdoing (considering the heat and difficult recovery). race summary: 28C/90% Rh. 850 finishers. 4th overall (1st Master). 34'57" (17"23"+17"34", but the first 5k I felt like jogging, the other 5k like the end of a marathon..). Thanks to all those who contributed with their comments. It might be worthy to elaborate more with a new post rather than reply on the comments section. It is really a interesting topic for me, because I have never seen any really good publication on the matter. yes, totally agree that the sensation of reducing the contact time on the ground is like having "stiff legs". Now I feel (especially in those faster workout), that my legs are like stiff levers rotating under the fulcrum of the hips. In my personal opinion, it is important to evaluate the starting point: what is your current cadence at different speed? If your current level is still far from the recommended (88-92 depending on the speed), then it might be worthy to work more on improving the cadence. If your stride is already quick enough, than maybe it is time to pass on to improve the stride length. So the improvement was due both to a quicker and a longer stride. Now, in my quest for running 2h35', I can calculate what I would need. in the PPT 5, there is a function "Reports" where you can monitor the trend of several data. You can choose which data to display and the date range, etc, etc. Unfortunately the PPT SW has some limitations in how the data are displayed and you can not draw average or trends. So I usually prefer to extraxt the data to Excel and manipulate the data. How to do: once the report is displayed, you can use the function Edit / Copy to clipboard to extract the data. Than I paste them to an Excel spreadsheet. I usually purge the data from all the workouts where I was not wearing the S3 sensor, to avoid the the presence of "0" would affect the real trend. In this way, I can see the trend of data over time and create moving averages to see the real trend. About your marathon, I have doubts that your stride lenght could have dropped so low at 130cm. Unless your pace dropped dramatically, the stride can not have dropped that much. I dig out more data from the Polar SW and here another chart. This is the average cadence of each workout from end 2006 to now. It shows an increase from the 80/81 to the 84 of today. From all I read, there is a significant agreement that increasing the turnover is the best way to increase speed: less load on the joints at each step and less "deceleration" caused by the impact of the feet on the ground. Actually since many months I tried to run my easy runs with small steps, like running in eggs. I noticed now that when I have my Marathon Pace runs, I keep around 89/90rpm, while in the past I was more around 86/87. I extracted these 2 sets of data from the Polar SW and might deserve some remarks.. I already showed this chart some months ago with an explanation. After 3 solid months of conditioning, the chart is going in the right direction. It is remarkable that I am getting very close to the same levels as my peak form last season, and it is still summer. Definitely this function of the Polar SW is worthy to keep under watch every month or so to understand the actual trend of the form. There is a quite close correlation between the trend of the Running Index and the actual performances in races. local newpaper: "Dressage more bore than draw for some"
Yet by the end of the first dressage session in the eventing competition yesterday morning, the initial euphoria stirred in many by the spectacular opening ceremony in Beijing had ebbed to boredom, and most spectators left the venue early. By 8am, and with two hours still to go, four shuttle buses provided by the Equestrian Company had picked up about 400 people from the competition venue and returned them to University station. As the temperatures rose, more of the nearly 10,400 spectators at the morning session began to leave. Almost two-thirds of the spectator stands were empty by 9.50am. Many had arrived at around 4am to get through the intense security. 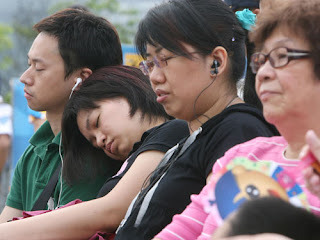 Some fell asleep in their seats, perhaps aided by the gentle music playing over loudspeakers. The run went quite ok, I was not brilliant so I just keep the legs going at a steady pace, with 2 climbs of 3km each. good workout, I need more sleep to feel more fresh. I always forgot to mention that Olympics Games are held mainly in Beijing, but also Dalian (sailing) and Hong Kong, Shatin Racecourse (for equestrian events). 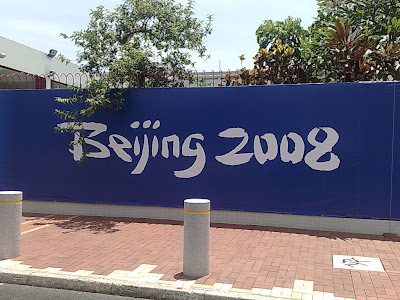 That brought a spate of renovation works, an incredible and redundant deployment of security measures and the decoration of all the surroundings with the "official" games banner: "Beijing 2008" "One World, One Dream", etc, etc. But the undeniable advantage of all these decorations is that while running you feel the same thrill as the "real" runners competing in a Olympic race.